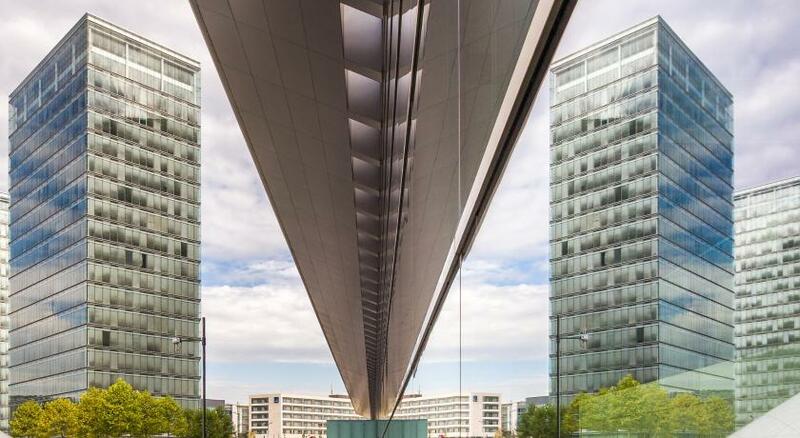 Lock in a great price for Novotel Luxembourg Kirchberg – rated 8.5 by recent guests! Breakfast had a great assortment. We used the kid area in the lobby everyday - wish more hotels had this area. Great stay for our family. Comfy beds. WiFi was excellent. 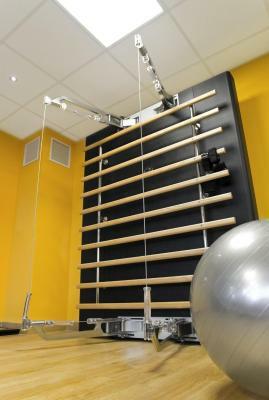 Located in modern Kirchberg, just a a few minutes tram or bus ride away from Lux City. Just a few stops on the tram that is less than 5 minute walk from hotel lobby and you have a movie theater (with some food shops including a McDonalds), several sit-down restaurants and bars, new shopping center and huge supermarket (Auchan). If you drive, you have to access parking area in front of hotel by a ticket machine, but hotel helps you with that. Room had a refrigerator and safe. Modern and nice hotel. Pretty close to the sity center. Big parking around. Good breakfast and good location. There is also an indoor parking. It was a pity to stay only one night. Very comfortable beds and room. The hotel was quite comfortable and clean! Everything new! The location is near to the public transportation and is easy to go everywhere from there! The staff is super friendly and helpful, all of them! 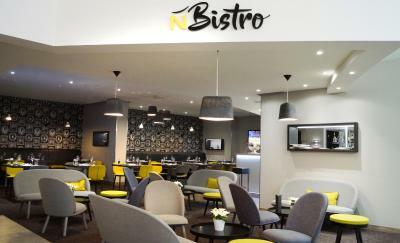 There’s also a pretty good Bistro at the hotel with good food and beverages. Great location. Easily accessible to public transportation. Good hotel fot a family stay. Nice room with two large beds. Excellent for the 3 of us. I loved the rain shower. Excellent buffet breakfast. They serve excellent coffee. Normal hotel, probably used for business travellers on workdays and by families visiting Luxembourg in the weekends. Loved that I could charge my electric car for free. 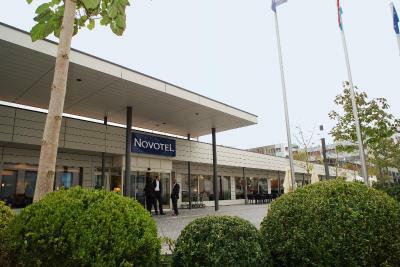 Novotel Luxembourg Kirchberg This rating is a reflection of how the property compares to the industry standard when it comes to price, facilities and services available. It's based on a self-evaluation by the property. Use this rating to help choose your stay! 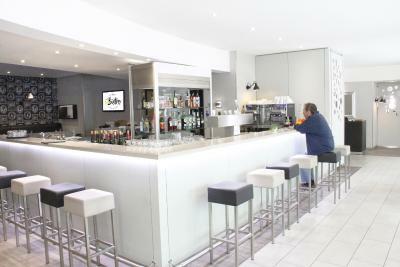 This hotel is in the heart of the Kirchberg area, just over half a mile from the MUDAM museum. Novotel has a restaurant and a bar. It has large, modern rooms. Free Wi-Fi is available throughout the hotel. 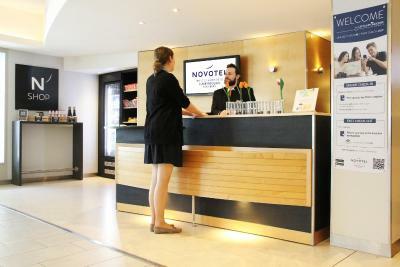 All of the rooms at Novotel Luxembourg Kirchberg have air conditioning, a minibar and a large work area. 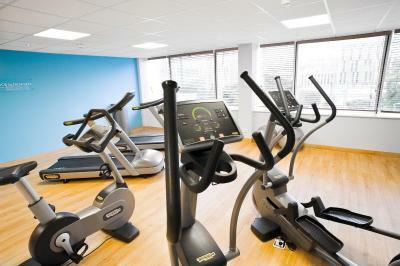 Guests can work out in the gym. After a workout, guests can relax with a drink on one of the 2 terraces. 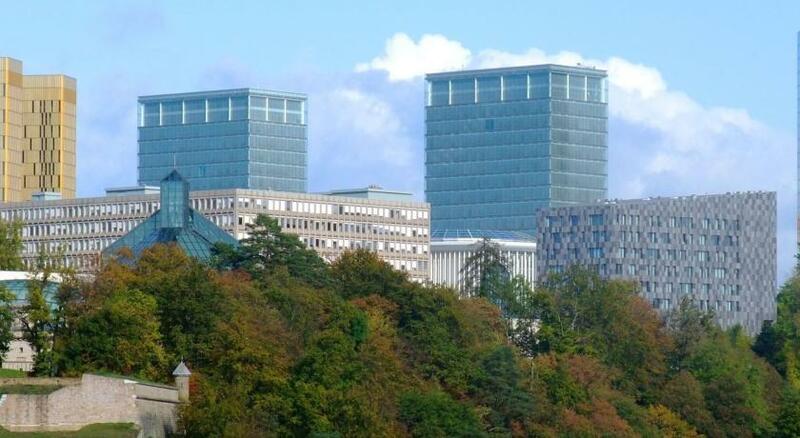 Novotel Kirchberg is a 10-minute walk from D'Coque National sports Centre and the Luxembourg Philharmonic. 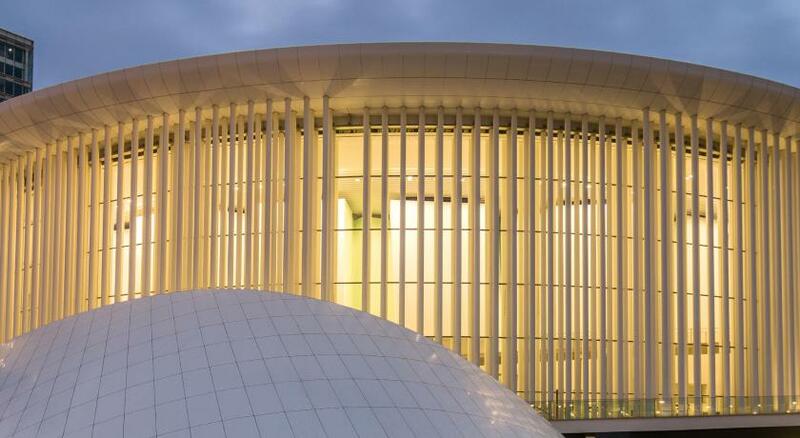 The Grand Théâtre de Luxembourg is a 15-minute walk away. The hotel includes a spacious on-site parking garage. 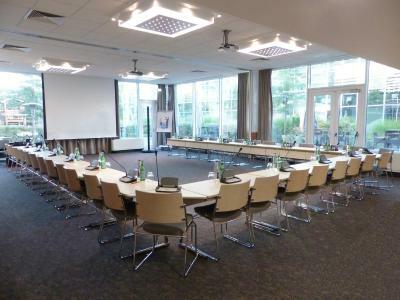 When would you like to stay at Novotel Luxembourg Kirchberg? 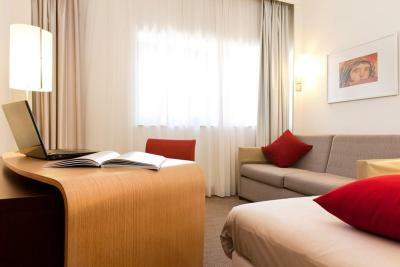 This spacious air-conditioned room includes a sofa, work desk and a minibar. Up to 2 children (16 years and under) stay free when sharing with parents. 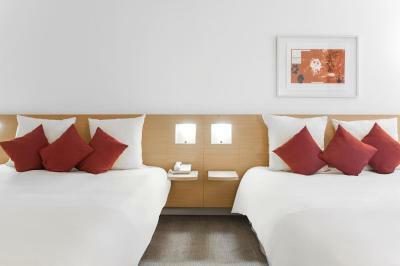 Please note that the maximum occupancy for this room is 4 guests including children and babies (see Extra Bed Rates). This spacious air-conditioned room includes a sofa, work desk and a Nespresso coffee machine. The bathroom has a bathtub and toiletries. Novotel stands for modern easy living and aims to give you whatever you need, whenever you need it. Making sure to offer you the appropriate facilities (be it a meeting room, a swimming pool or an area dedicated to children): this is what we call being a full-service brand. At Novotel, everyone is free to live as they want. As a family or solo. On vacation or for work. 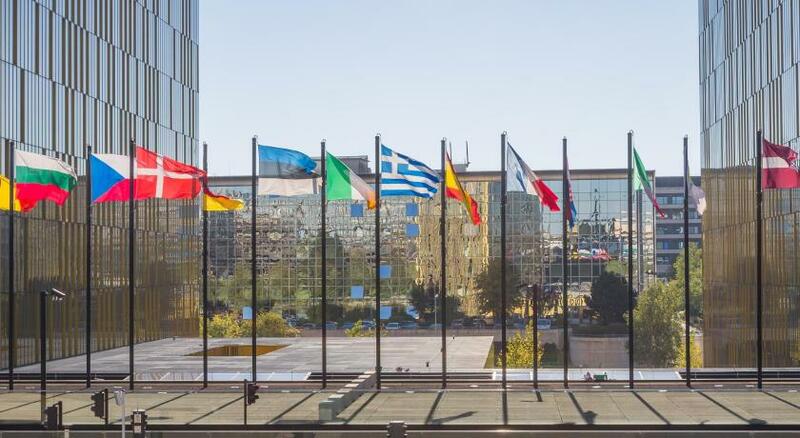 House Rules Novotel Luxembourg Kirchberg takes special requests – add in the next step! All children under 16 years are charged EUR 30 per night for extra beds. Novotel Luxembourg Kirchberg accepts these cards and reserves the right to temporarily hold an amount prior to arrival. Please note that guests are required to show the credit card the booking was made with, or an authorization form signed by the credit card holder if he/she is not traveling along. Otherwise the payment will not be accepted. Guests staying with children are required to inform the hotel of the number of children and their age in the Special Requests Box. 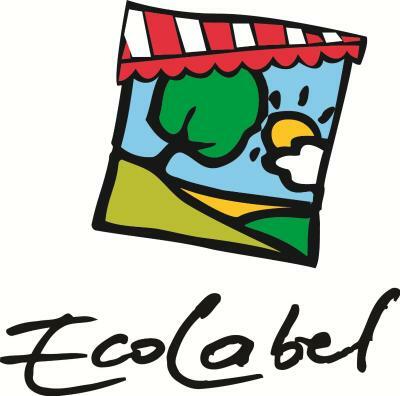 Location is great, staff are friendly. Friendly and welcoming staff, really kid friendly hotel. 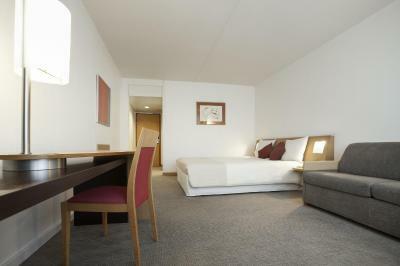 Spacious rooms, well appointed, easy public transport access. Location of the hotel is very convenient. However, our superior double room was right opposite of a big construction site. We stayed only 1 night on a public vacation, so no issues with noise. There were only paper cups in the bathroom and cattle..this is more hostel style rather than a 4* hotel. Also the amenities were very poor, no body lotion etc. The worst for us were the small and extremely hard pillows. This made our stay really uncomfortable. We will definitely not come back. Staff was very friendly and polite. As it was a Sunday, i could check out till 16:00 hrs. Had more time to relax. loved the location and the receptionists were great! Requested an extra bed in room at time of booking. Booking.com confirmed request would be actioned, but hotel was not able to comply as no beds exist in the property to add to the room. Also hotel had no record of the emails on their system. Staff going out of their way to try to resolve non-compliance of request at time of booking. Really hot rooms. Terrible coffee. ➕ Breakfast was nice, rooms were clean and comfortable. The restaurant. I ordered a vegan risotto and got one with octopus. Got a quick apology and new food, but they expected me to pay as normal. I'm a vegan, and in addition allergic to fish and seafood, so I argued that I should not pay full price. They grumpily accepted this, and in the end I got the dinner for free, but they should've offered this themselves. I emailed a question a few weeks before the stay and despite a reminder I never got a reply. Nice, large room. Friendly reception staff. Good breakfast buffet, but not included in the room price. Quick checkout option is nice to avoid having to queue.